There are times, when you finished viewing a flick and ended up with mixed emotions of being impressed and confused at the same time. It is a brilliant effort and attempt at directing a movie in a different style and for that alone it is worthy of noting down. Director Kelvin Tong has created a film that is layered within layers of blurring the boundaries between reality and fiction. Neo must claim that he is certainly impressed by all the Focus Cuts (invested by Andy Lau so far) and this flick certainly matches all its predecessors and adds extra points for being seemingly complex. It is a film that Neo with full honesty did not fully get it, but the journey itself is worth taking. Tong is a relatively unknown director and apparently he produced some fine works in the last few years, but still this is a brave cinematic effort and a movie as disconnecting and relating as one can imagine. By all means, this is really a random movie that is full of random events. Whether Tong is a postmodernist or not, it is not important as his ideal and notion of love is expressed in a manner that is totally random and by chance. There are few lines worthy of mention, most notably the one about – love can be a cliché and a false love. Tong blurs the boundaries of reality and fiction, by switching seamlessly from real life experiences to pages of a love story. At the end the day, it is really unknown as to what Tong really wants to say as the complexity of this flick kept on piling up and by the end of the flick, it have certainly become more confusing than its own good. 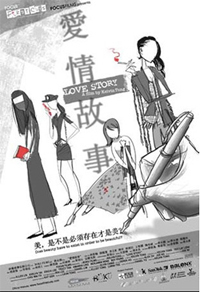 Nonetheless, Tong has produced something different and one that makes the audience think about the differences between true love and false love. There is another quote – there are two types of love, the ordinary and mundane one that last forever and the dazzling one that is short-lived. Tong goes on to pose the question of which one do you prefer? It is both a rhetorical question and a question that remains within the hearts of the audience. It is all the more interesting that Tong goes on to an inconclusive conclusion and indirectly claiming that love is in fact a forbidden thing. Perhaps, an earlier dialogue seems more conclusive – why do people go into false love? The answer is simple – we have no choice. The performances of the numerous female leads come and go so often that it is difficult to judge on their respective acting. They aren’t really required to do much as they randomly appear in the male lead character’s life. It is a movie that shows the director as the leading actor, rather than anyone on screen. Allen Lin does well, in a role that so similar to Tony Leung Chiu Wai in 2046. As a writer that uses women by bedding them as an inspiration to his writing, Lin is extremely convincing, but once he is overshadowed by the overtly artistic direction from Tong.